Geometry is one of the major branches of mathematics which studies shapes, angles, lines, and spatial relationships. 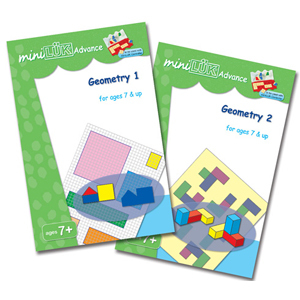 These two workbooks introduce all the essential elements of geometry via colorful illustrations and easily understood graphics in order to deliver the most effective learning results in geometry. Lines, planes, 3D figures, measurement, combination of shapes, area, surface, pattern, symmetry, and spatial relationships are all covered in these exercises. The comprehensive contents enhance spatial thinking ability, strengthen reasoning and logical thinking, and improve visual perception for children at the elementary level.